Chabad at Yale University is co-directed by Rabbi and Mrs. Shua and Sarah Rosenstein. Rabbi Rosenstein grew up in Oak Park, Michigan and studied at rabbinical seminaries in Detroit, Miami and New York before receiving his rabbinical ordination in 2004. Sarah grew up in Brooklyn and graduated from the Beth Rivkah seminary in New York. The Rosensteins moved to New Haven in 2005 with the goal of creating an exciting and warm Jewish experience for every Jewish student and faculty member at Yale. 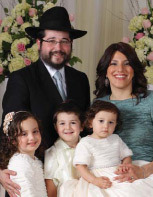 They are blessed with three beautiful children: Rachel, five; Menachem, three; and Mushka, two… all proud young members of the Yale Jewish community.